In this paper, we present our ongoing research project. 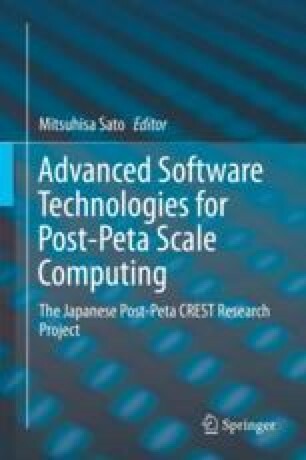 The objective of many ongoing research projects in high-performance computing (HPC) areas is to develop an advanced computing and optimization infrastructure for extremely large-scale graphs on the peta-scale supercomputers. The extremely large-scale graphs that have recently emerged in various application fields, such as transportation, social networks, cybersecurity, disaster prevention, and bioinformatics, require fast and scalable analysis. The Graph500 benchmark measures the performance of any supercomputer performing a breadth-first search (BFS) in terms of traversed edges per second (TEPS). In 2014–2017, our project team has achieved about 38.6TeraTEPS on K computer and been a winner at the 8th and 10th to 15th Graph500 benchmark. We commenced our research project for developing the Urban OS (Operating System) for a large-scale city in 2013. The Urban OS, which is regarded as one of the emerging applications of the cyber-physical system (CPS), gathers big data sets of the distribution of people and transportation movements by utilizing sensor technologies and storing them in the cloud storage system. In the next step, we apply optimization, simulation, and deep learning techniques to solve them and check the validity of solutions obtained on the cyberspace. The Urban OS employs the graph analysis system developed by this research project and provides a feedback to a predicting and controlling center to optimize many social systems and services. We briefly explain our ongoing research project for realizing the Urban OS. This research project was supported by the Japan Science and Technology Agency (JST), the Core Research for Evolutional Science and Technology (CREST), the Center of Innovation Science and Technology based Radical Innovation and Entrepreneurship Program (COI Program), JSPS KAKENHI Grant Number JP 16H01707, and the TSUBAME 2.0 & 2.5 Supercomputer Grand Challenge Program at the Tokyo Institute of Technology.